FastGo introduces its FastBike Pro drivers in Ho Chi Minh City in this photo posted on the company's Facebook. 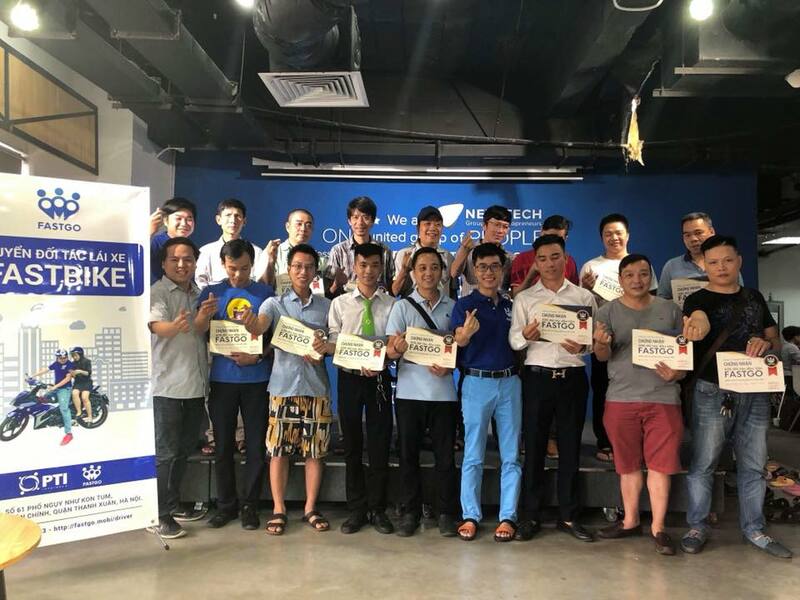 One more Vietnamese company has debuted in Ho Chi Minh City’s ride-hailing market, filling up the competition in the tech-based transportation sector. FastGo, a mobile app developed by a Vietnamese start-up under NextTech Group – a group of companies pioneering into the emerging digitized commerce industry across Southeast Asia, has been officially present in the southern metropolis since Friday, more than one month after it began operations in Hanoi. Operating in a motorbike-dominated Vietnam, FastGo chose to first roll out the two-wheel service called FastBike Pro in Ho Chi Minh City, just like other forerunners in the ride-hailing market. The difference is that drivers must undergo a rigorous recruitment process, and ethical and attitude judgment, and are required to use high-end motorbikes to be able to join FastGo. Moreover, FastGo will focus on recruiting and training only 500 drivers for each market in Hanoi and Ho Chi Minh City in the first three months, according to the company’s plan. The company will offer competitive prices, under a special driving policy, and will try to ensure a minimum income of VND6 million (US$258) per month for FastBike Pro drivers. “FastGo's entry to the market will provide a new option to customers, addressing the pressing concerns of both customers and drivers after Uber exited [Vietnam and other parts of Southeast Asia]," said Nguyen Huu Tuat, general director of FastGo Vietnam company. Fastgo is currently the only ride-hailing firm that protects customers on their trips with Fast Protection insurance, a product in cooperation with Post and Telecommunication Insurance (PTI). In addition, FastGo Pro is also deploying 5,000 FastBike rides that charge customers VND5,000 ($0.22) for the first five kilometers of each trip. This promotion reportedly resembles the campaign by Go-Viet, the local brand for Vietnamese market of the Indonesian ride-hailing and online payment firm Go-Jek. After one month of implementation in Hanoi, FastGo now has more than 6,000 taxis and other vehicles registered to its service. Its application also attracted nearly 20,000 installations and registrations, with 5,000 customers booking at least one trip.